"The prison experience was a blessing for me," says Garvar Brummett, who left his San Fernando Valley home at age 17 to escape an abusive stepdad and an alcoholic mother. He fell into a cycle of addiction, alcoholism, homelessness, bank robbery, and incarceration that lasted 20 years. He served five years in prison, part of it in Illinois, the rest at the Sheridan Prison in Oregon. "I read a lot of self-help books and religious texts," he says. "I started going to AA meetings. I got a GED in prison." 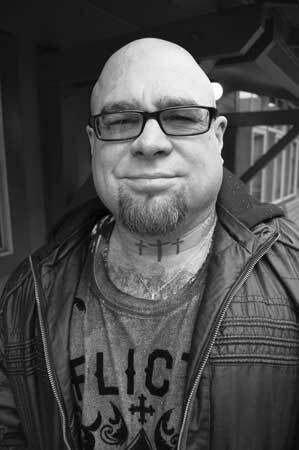 Shortly after his release, Brummett arrived in Eugene, where he lived in a recovery house for two years, then ran a recovery house for a year. He studied at Lane Community College and became a certified drug counselor. Since 2004, he has worked as a counselor at Sponsors, Inc., an agency that provides transitional housing and reentry services for men and women released from prison. "It's a walk-in kind of thing," he says. "I just guide people through things they have to navigate." Brummett began to write stories while in prison, gritty vignettes, with no expletives deleted, from his own life on the street. His self-published book of stories, The Scent of Jasmine Cools the Rage, illustrated with his own drawings, made its debut on Amazon in July. "It took me 20 years to write it," he says. "There was a lot of emotion behind it. I wanted the reader to see where addiction comes from." Brummett will read from his book at 7pm on Thursday, January 21, at Tsunami Books, 2585 Willamette in Eugene.